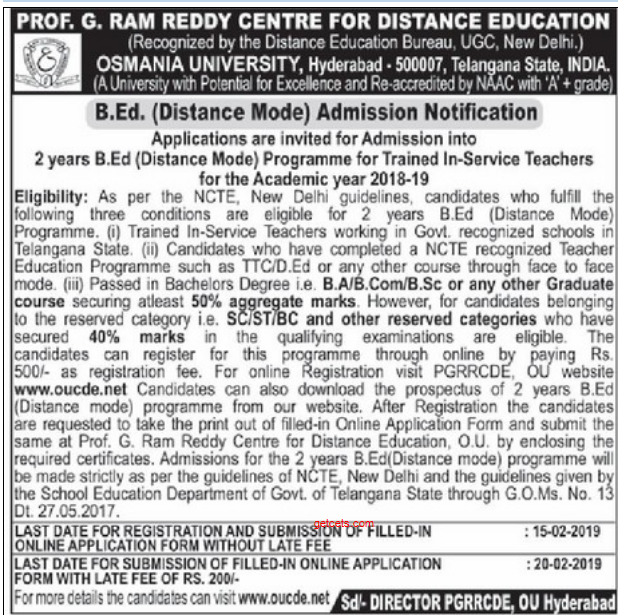 OU Bed distance education 2019 admission notification : Distance Admissions wing of Osmania University, Hyderabad has issued the ou bed distance notification 2019 for admission into 2 years B.Ed course for trained in-service teachers for the academic year 2019-2020. The University would invite the applications through online only from the eligible candidates for admission into B.Ed course through Distance Education Centre of Osmania University. The interested candidates can apply for the admissions in online mode from 19th Jan 2019 Last date for registration and submission of filed in online application form without late fees is 15th Feb 2019 The candidates can find the important details related to the OU Distance education notification 2018-19 through this article. iii) Bachelor’s Degree Qualified Teacher: Passed in Bachelor’s Degree i.e., BA/BCom/BSc or any other Graduate Course securing 50% aggregate marks. However, for candidates belonging to the reserved category i.e.,SC/ST.BC and other reserved categories who have secured 40% Marks in the qualifying examination are eligible. 2. Physical Sciences Candidates with B.Sc who have studied Physics and Chemistry or material sciences under Part-II group subjects or BCA candidates with Physical Sciences (Physics and Chemistry) at Intermediate level as group subject. 4. Social Studies All candidates with BA/B.Com/BBM and BBA candidates with Social Sciences at Intermediate level as group subject. Examination pattern : A 2 tier evaluation shall be used by the institution for the continuous and comprehensive evaluation. The weightage for internal and year end examination will be in the ratio of 30 : 70 (Internals : 30 % and year end examination = 70 %. Intake : As per the permission of NCTE, New Delhi the intake for the B.Ed (ODL) programme is 500 seats. These 500 seats will be allocated for 10 study centres located in OU jurisdiction, depending upon the number of admissions in each Study Centre. Each Study Centre is given 50 students in a given session. Duration of the Programme : The duration of the B.Ed (ODL) programme shall be of 2 years. However, students shall be permitted to complete the programme within a maximum period of 5 years. The commencement and completion of the programme shall be so regulated that 2 long spells of vacation (Summer / Winter) are available to the learners guided / supervise instruction and face to face contact sessions.